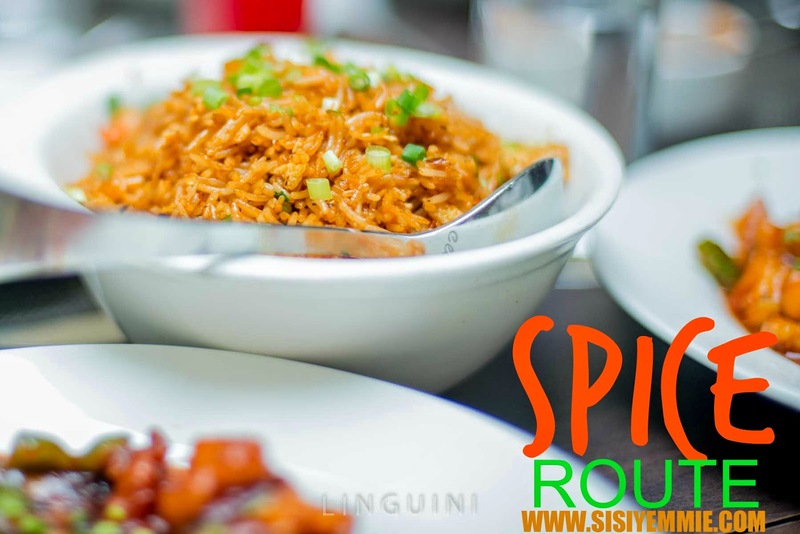 In my Monday Chit-Chat post I told you all of how the lovely Tuke invited me to Spice Route for lunch, she wanted to take me out as wedding gift to Bobo and I. I was very very very happy about that especially as I've heard a lot about the place. I pass it often on Adeola Odeku and I always wondered..."what goes on there".... I remember when Kemi Adetiba complained about the restaurant saying they didn't allow her enter because she was unaccompanied by a man: that made me scared. `Now that I've been there I can probably understand why: the place is filled with expatriates and they are being careful not to turn it into a semi-brothel...they are probably trying to keep it clean. I get that. I still think it is a bit discriminatory sha. We received a nice welcome: we were greeted at the entrance by some guys with huge biceps and we were directed to the hand sanitiser sitting in the corner (These are Ebola times). The waitress showed us our table and kept us in this nice secluded part of the restaurant, which was great because we were just yapping all through! She helped us with the menu, suggesting picks that she thought we would like: it's not easy to choose your food in an Indian restaurant. It was very nice inside the restaurant, cool calm relaxing. Its very cosy, dim lights everywhere, colourful and the ambiance is just lovely. Bobo was saying it was a place to bring a babe when a guy is trying to take things to the next level i.e propose. LOL. It wasn't noisy, soft music playing in the background, Asian and Indian decor all over, along with a huge Buddha in the middle of the restaurant, you certainly get an out-of-lagos feel. I went with Bobo, Shade, Tuke and Busayo. Tuke is a blogger and you can visit her blog HERE. Busayo is a photographer: he took these amazing photos. See more of his work HERE. For the first time I enjoyed a meal I'm reviewing without any form of distraction, typically I'm the one holding the camera but on this day...I just dey chop dey go! This is the first time we were all meeting and we spent over 4 hours together, chatting! It was so much fun! We had Goan fish curry, poppadoms, plain white rice, Chinese fried rice, samosa's . I loved almost all I ate expect the samosa (it was big and I really didn't like the way it tasted). The goan fish curry was cooked with coconut, mango and other indian spices. I love fish. We also ordered for different types of naan bread and I loved them all. Next time I'd probably stick more with the Chinese cuisine as I think Indian takes some getting used to. Chai...this is the most expensive restaurant we I don chop (in Nigeria). The bill for Bobo and I was 17,000K. Ojigbijigbijigbi . We ordered fried rice, plain white rice, naan bread, 2 bottles of chapman and 2 sauces. Make sure you study the menu well when you reach there. Asides the bill, I loved everything about it. I'll definitely go back to Spice Route if I had a special day but not really to branch and chop. The place looks lovely and expensive. I'm a big fan. But this is the first time I'm commenting on your blog. I enjoy Spice Route and have been there a handful of times (less than 5). However, the bit about not letting females (unaccompanied by men) in after a certain time is true. The bouncers were downright rude to my friends and I (3 of us), lying that the whole restaurant is closed off for a private party. I'd like to point out we were all well dressed. (2 of us were in long sleeves, 2 in jeans, me in a skirt). We went there because our friend was in from South Africa and we wanted to show her something 'different' in the Lagos scene. While this was going on people were streaming out (so we could tell the place wasn't at capacity), men were strolling in, and might I add, the 'quality' of some of the people streaming in and out was questionable. I'd like to leave it at that. This blanket policy by them and Rhapsodies needs to be stopped. At the end of the day, most of these places end up having 70-80% guys inside because of this reason. And the supposition that women cannot pay for their own drinks and are scouting for men is not only archaic, it's degrading. How they treat you when you try to question why you can't enter is really bad. Might I add I haven't been there since then. This happened about a month or 2 ago. WOW!!! I was hoping Kemi's story was a one-off, but if this is their standard practice, then I'm very very disappointed. What kind of thinking is that? I understand that they don't want ladies of the night in their establishment, but are they trying to say that all females in Lagos are like that? So if I decided to take my girls out for a weekend outing, they'll turn us back because we're without men? looks good and that dude is a really a linguine. hello Berry,pardon my intrusion but did they let you and the ladies through unaccompanied by a male? I was thinking of taking my mum and sister there for my birthday dinner this weekend but all these 'bouncing' stories are now fearing someborri oh. Hi Sisi, lovely review. Great work you r doing too. I sent you a mail yesterday, don't know if you got it. my weight loss blog; www.theshapecube.blogspot.com. God bless. Enjoyment galore... my mouth is watering already oooo... lol.. Please what's the address to the restaurant? I need to go there when I come to Lagos. Thanks in advance. PLs how tall is Linguini??????? I love you and your blog, Sisi Yemmie, but I must confess I was a bit disappointed when I saw this review on your blog. In a patriarchal society like ours we need all the help we can get to stop unnecessary discrimination against women. It might be a 'small' thing like being turned back at a restaurant today, but tomorrow it will become a slap by your colleague in the office. Kemi complained about this place and they confirmed that they did turn her back because she was alone. Personally I would not spend my 1 kobo on that sort of place afterwards but if you choose to eat and spend your money there doing a review is too much for them. They don't deserve it. This is my 2 cents o. I hope it doesn't offend. Hehhehe Yimu. Food 1st always and forever. And about the review, you know spice has their regular and loyal customers like ME. So people like me will still patronise anyway.